This is not a challenging problem in theory for my students in this course. However, the algebra is a bit snarly and unpleasant. They debated amongst themselves and seemed happy at the end about their work. I stepped up and did the problem on the board, with their guidance, and we arrived at the conclusion that the x-coordinate of the point of intersection was x = 3. Hmmm, I wondered aloud whether there is something going on here that x = 1, x = 5, and x = 3 seemed to have a nice relationship. I quickly examined the boring old standard parabola at the origin facing up and we saw the same thing. One of my students commented that this was probably generally true but these examples certainly did not prove this in any way. I sat back down and got to my work and a few minutes later a student named Richard called me over to show me that he had confirmed that this would always be true by replacing the 1 and 5 from my problem with p and q. His answer, instead of 3, was the average of p and q.
I cannot accurately convey how pleased I am that he was persistent enough to do this. It would have been the easiest thing in the world to accept this conclusion and to move on to the next problem especially since his neighbors had moved on. So he removed himself from a stimulating conversation with his friends to satisfy his curiosity (and maybe to prove something to himself about his ability to push through) about a problem that likely will not have any future impact on his calculus grade. What will have an impact is his increased belief that he can solve a snarly problem. Pretty pleased, I must say that my Friday morning started off this way. What is the probability that all four are heads? What is the probability that all four are heads if I tell you that at least one is heads? What is the probability that all four are heads if I tell you that at least two of the tosses are heads? What is the probability that all four are heads if I tell you that at least three are heads? A number of my students struggled to see why the changing information changed the probability. In my first class they dutifully followed my path of reasoning as I drew the outcomes and talked about the answer. It was not until we reached questions three and four that I saw light bulbs go off. In question three I told them that a friend of theirs reported having tossed a coin ten times and seeing a head each time. Their friend tells them that he KNOWS that the next toss will be tails. Their job was to convince their friend otherwise. In question four the conversation continues with their friend arguing that there is only a 1/2048 chance of eleven heads in a row. No way that will happen! Again, they were asked to address their friend’s misconception. While we discussed these two questions a number of students popped up and said that the first question now made sense. So in my afternoon class I swapped the order of the conversation and question one fell into place so much more easily. I am definitely changing this order for next year to help support my kids as they develop their understanding of probability. One of the great joys of my life these days have been long walks with my iPod Touch. Last winter I won a Fitbit Flex at a school raffle based on a wellness challenge. Since I got it I have been much more conscientious about being mobile and I am no fan of running so I take long walks. With my iPod earbuds in place I go off and I listen to podcasts. There is not enough time to listen to all that I want to. I subscribe to Radiolab, This American Life, Sound Opinions, The Memory Palace, 99% Invisible, The Moment, and Marc Maron’s WTF podcast. Early mornings, late nights, and long walks are filled with these voices and these ideas in my ear. The newest one that I added was The Moment and one episode in particular caught my attention. Brian Koppelman, the host, had Seth Godin as his guest. Now, I have to admit to being ignorant of Godin but I was intrigued enough that I dug through the podcast archives to find an earlier conversation with him. One thing in this world that makes me especially happy are when I find little synchronicities, little places where ideas converge or where I become aware of something then see it in other places. Well, one of those just popped up again. As I was in the midst of the podcast with Godin I got an email from one of my former colleagues, a woman named Gayle Allen. Gayle (you can find her here or on twitter @GAllenTC) has been a great influence on me as an educator since I first interviewed with her for the job that brought me north from Florida. Gayle is a dynamic thinker and was a fantastic resource when we worked together. She challenged me to grow, to be more reflective, and to expand my world. She is one of the reasons my blog exists. I feel fortunate to have her as a friend and a wise voice when I need advice. Well, Gayle wrote to tell me that she is launching her own podcast and her first guest is, you guessed, Seth Godin. I am so excited for this endeavor and added her feed to my iPod this morning. I cannot wait to hear her conversation with Godin and I am excited to have her voice back in my ear. You should check out her site and listen in to hear what she is up to on her podcast. Last year I opened the door to a conversation about proof by adapting an activity from Max Ray-Riek over at the Math Forum. 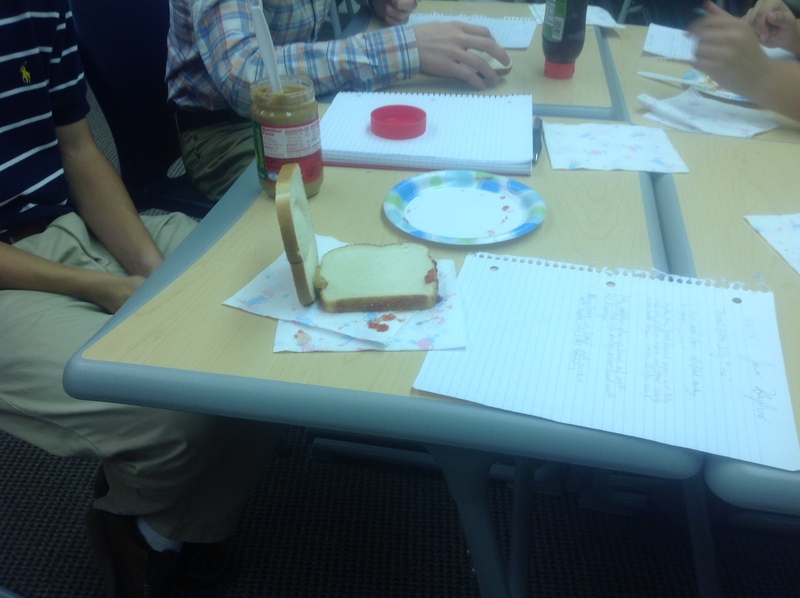 I asked my Geometry kiddos to write out directions for how to make a Peanut butter and jelly sandwich. 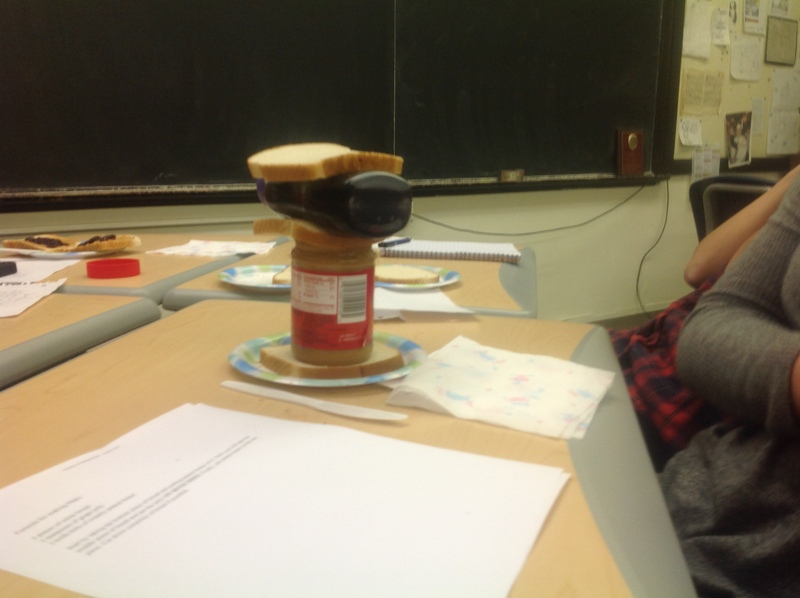 I swapped directions around somewhat randomly and asked the students to do their best to make a sandwich only following the directions given. 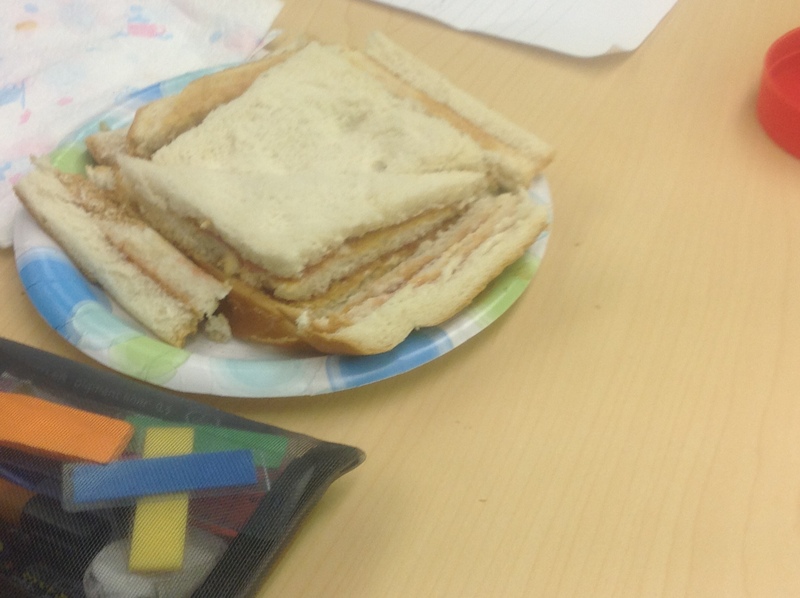 It is a fun activity, the kids get a laugh out of it and we have some yummy afternoon snacks. Most importantly, I think that it makes a vivid point about how detailed you need to be at times when trying to tell someone how to do something. I will use this conversation and activity as a reference point over and over in the next few weeks as we begin to grapple with what it means to prove something and how you can explain to someone why you think that something is true. 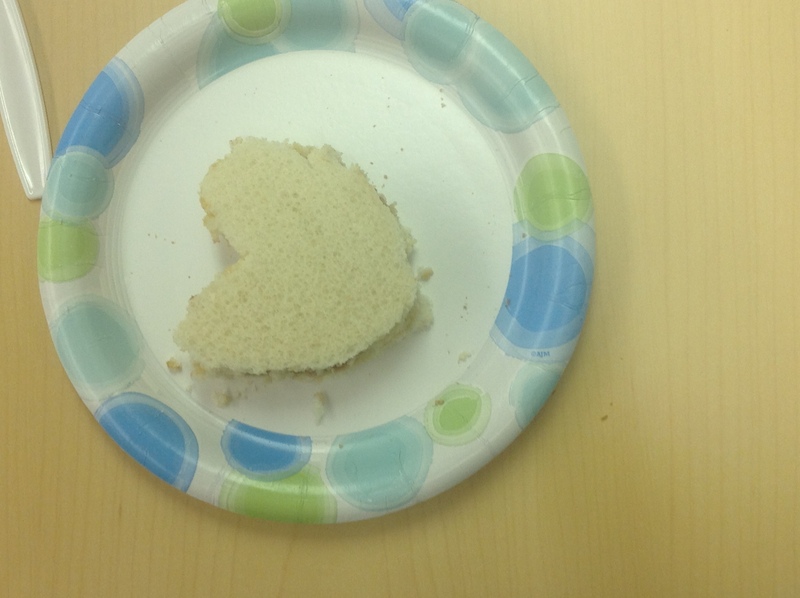 I took a few photos of the sandwich designs that I want to share here. In the first one, try to notice on the paper how scant the directions were. Last year I had such a thorough and detailed description written by one of my students that I posted her PDF document here on the blog. I have yet to dig through all of the directions that were turned in this year, so I do not know if there is a winner in that category again this year. Here are some of the fun photos from the day. There are always great posts over there.